(Nanowerk News) Computational physicists have developed a novel method that accurately reveals how electrical vortices affect electronic properties of materials that are used in a wide range of applications, including cell phones and military sonar. 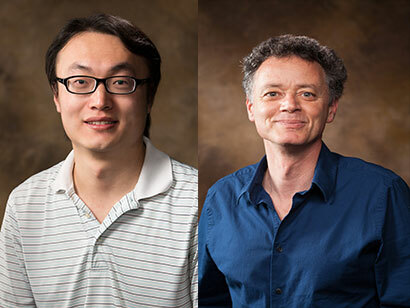 Zhigang Gui, a doctoral student in physics at the University of Arkansas, and Laurent Bellaiche, Distinguished Professor of physics at the U of A, along with Lin-Wang Wang at Lawrence Berkeley National Laboratory, published their findings in Nano Letters ("Electronic Properties of Electrical Vortices in Ferroelectric Nanocomposites from Large-Scale Ab Initio Computations"). Gui used supercomputers at Oak Ridge National Laboratory to perform large-scale computations to determine the electrical properties of electrical vortices in ferroelectric materials, which generate an electric field when their shape is changed. An electrical vortex occurs when the electric dipoles arrange themselves in an unusual swirling movement, Bellaiche said. In this ferroelectric system, electrical vortices are created and determined by the temperature of the material, Bellaiche said. The simulations also revealed that the existence of an electrical vortex increases the band gap – the major factor determining a material’s conductivity – in this material, which offers insight to the controversial issue about the origin of the conductivity of electrical vortices.